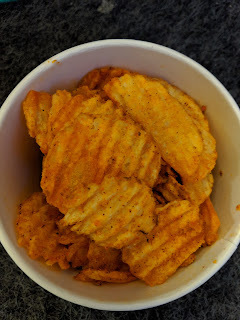 I've had a thing for salty, crispy snacks lately, so I've been trying out all sorts of chips. It is pretty random, as I honestly think I hadn't had a bag of chips for about 10 years, and suddenly I crave them all the time. 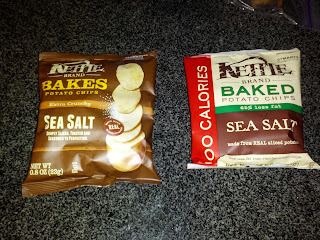 Kettle brand chips show up as the "premium" chips at most delis and casual places around town, so I've tried a bunch of their flavors. I don't really care for their standard chips, but the Krinkle Cuts and the Baked ones are pretty decent. As always, subsequent tastings are denoted inside brackets. 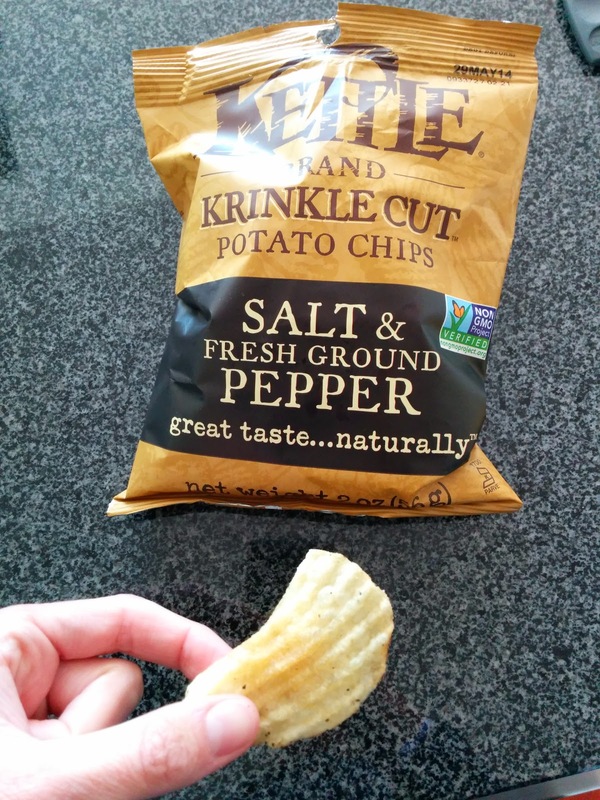 "We slice our Krinkle Cut™ chips nice and thick, so you get a satisfying crunch in every bite. It’s the perfect chip for dipping, but you don’t need to with all the bold, all-natural flavor nestled into those rich, golden ridges." I really like the krinkle cut chips. They are so crunchy and satisfying, my favorite of Kettle brand products. "From the first, bold crunch, you’re hit with a tangy assault of chili spice. But…wait for it…a hint of bleu cheese comes around the corner and pulls it all together in a supremely craveable, insanely crunchable mouthful of goodness." These didn’t really seem like buffalo flavor (not spicy as described), nor did they seem blue cheese flavored. But, I did like them. They had a sweetness to them, and reminded me of bbq chips. The crickle cut allowed for maximum coating in the chips. Salt & Fresh Ground Pepper, Krinkle Cut. "There is a reason they make salt and pepper shakers in matching sets—they go together like no two other spices in the world. 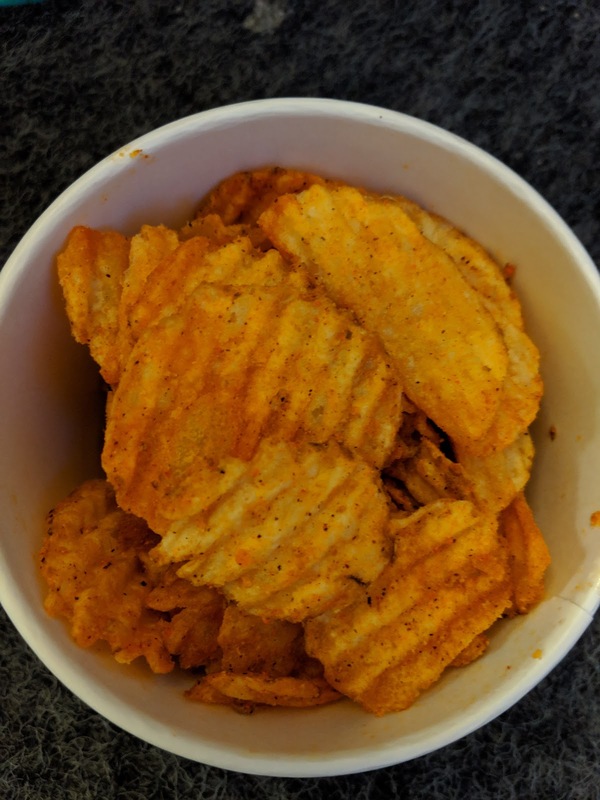 We’ve taken that collaboration of flavor goodness to new heights (and depths) by lightly sprinkling them on the rolling ridges of our Krinkle Cut chips." I thought that I'd dislike this flavor, since I've had pepper chips before and really disliked them, but these were not bad. Not my favorite flavor, but, decent. The pepper flavor was there for sure, but somehow it wasn't strange. Salt level was also good. 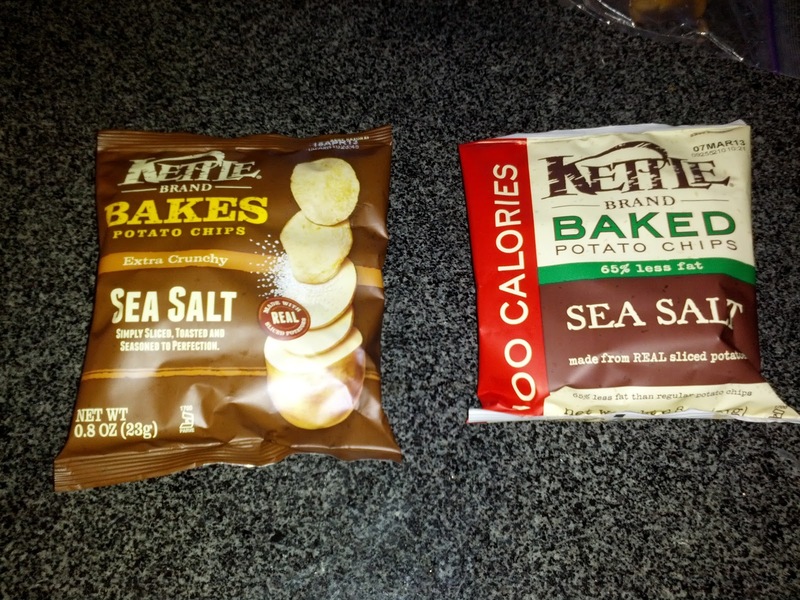 "Kettle Brand Baked potato chips are made from REAL sliced potatoes, unlike many other baked chips you've tried. We take real potatoes. Slice them. Cook them to a crunchy perfection. Then season them with fresh, natural ingredients." The baked chips also aren't bad. They clearly don't go too far in the "healthy" direction, still keeping them satisfying. This is their original, and namesake kettle style line of products. My least favorite of their offerings, generally, just thin, standard kettle chips. They do have some creative flavors though, I'll give them that. Sweet Chilli and Sour Cream. "There's nothing like Thai Cuisine for its wonderfully complex balance of flavours. We've added our own twist to the authentic spicy sweetness by combining with the coolness of sour cream." These are available in Europe only. When I saw these, I had to try them. When I lived in Sydney, I became a bit obsessed with potato wedges served with sour cream and sweet chili sauce. To this day, I still do not understand why we do not have them in the US. I was interested to see them made into chips. The chips were basic crunchy kettle chips, nothing remarkable. The sweet chili flavor was a bit lost though, they tasted more like bbq to me, except bbq crossed with sour cream and cheddar. Interesting, but, nothing like what I wanted them to be. "Our flavor experts have done it again. 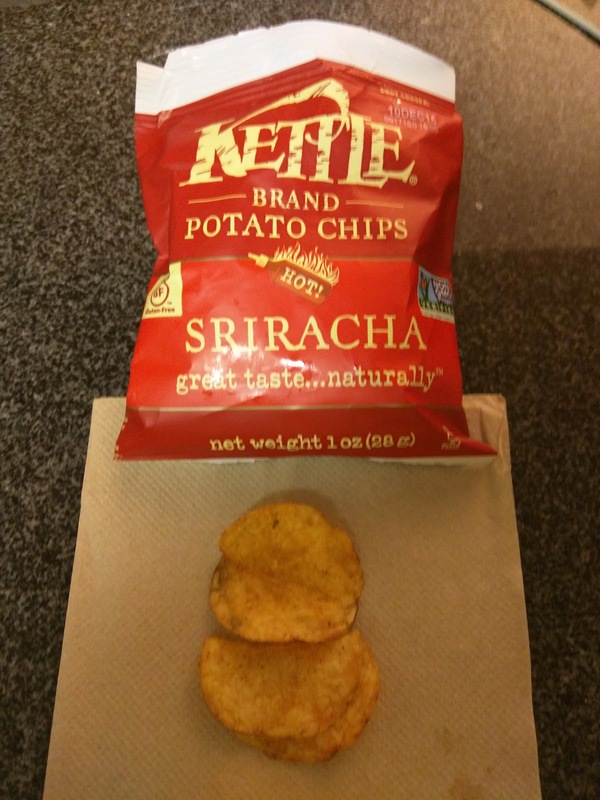 This bold flavor is everything you love about the hot sauce on a chip. The combination of chili, garlic, and vinegar creates the authentic taste of the real deal". These were actually really quite good. Did they taste like sriracha? Well, no actually. 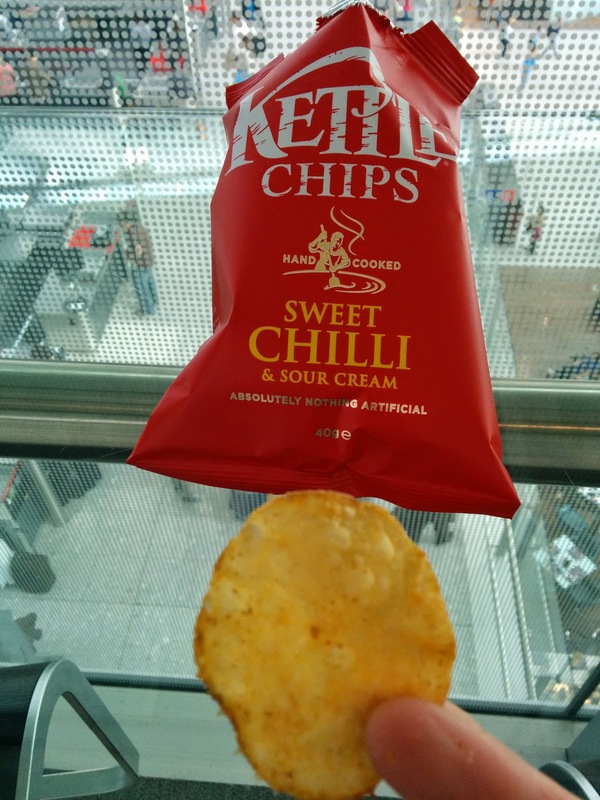 Like the sweet chili chips, they reminded me of a bbq chip. The initial flavor was actually sweet. They did have a kick to them that came in on the finish. Really a fun chip to eat, since it evolved from sweet to spicy. But sriracha? Nah. Particularly tasty with some dip. Update: I had these again months later, completely forgetting that I had tried them before, and without re-reading this review. 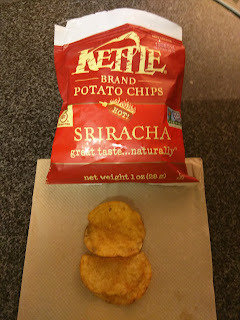 I again liked the flavor, but found that it didn't taste like sriracha at all. And, again, I enjoyed dipping them in a dip (this time, chive creme fraiche), but I thought they were fine plain too. 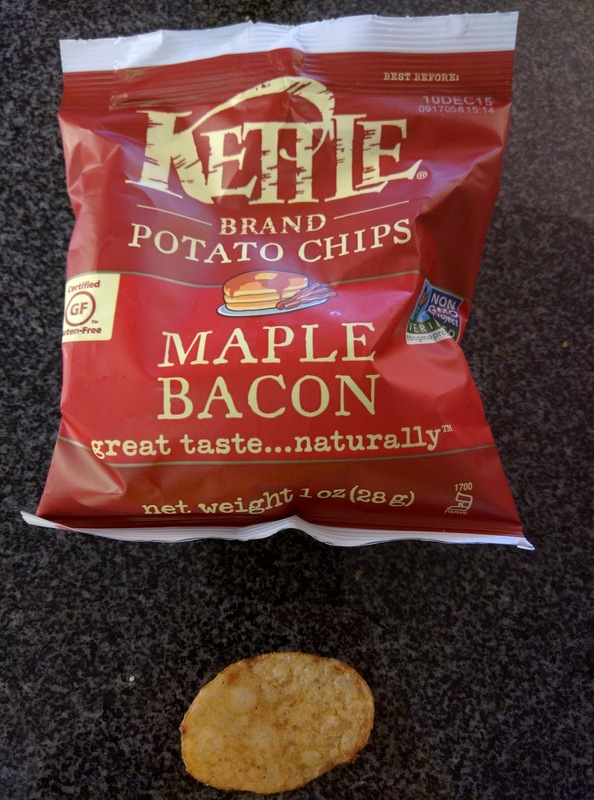 "This natural flavor match combines the deep smokiness of bacon, the rich sweetness of real maple syrup and the subtle spice of chili pepper for a nostalgic, comfort food combination. " These obviously sounded like winners. Who doesn't love maple and bacon? Alas, like many other flavors, they really just tasted bbq-esq to me. 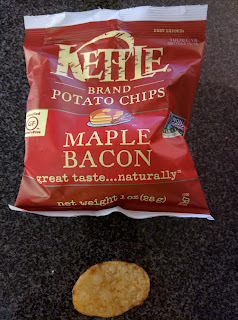 BBQ isn't a bad thing, but I really didn't taste anything maple nor bacon about these. Really, just standard bbq-like kettle chips. New York Cheddar: "When cheese grows up where does it go? The big city, of course. Sophisticated, bold, confident, and brazen". Tasting notes: I really did not care for these. They weren't cheesy at all. I honestly did not taste any cheddar at all. They were very oily. Sea Salt (Europe Only): "Sometimes less is more. Thick, full-flavoured slices of carefully selected potato are brought to life with just a sprinkling of sea salt - simple. ". Tasting notes: Just greasy standard kettle chips. Meh. Yes, I'm reviewing another fast food chain, which I know kills my foodie street cred, but at least I'm not reviewing their primary product? And, you can probably guess why. LevelUp, of course! Quiznos is on LevelUp, and they seed your account with $2. This obviously can't buy a sandwich, and I'm not really sure I would want their sandwiches anyway. But if I had $2 to spend, I might as well try it, right? At first I was tempted to just get chips, as they had a huge selection, and I've been really into chips lately (I have no idea why). But then I saw that all of their desserts were $1.49! There were several varieties of cookies, brownies, and rice crispie treats, all pre-wrapped and clearly not baked fresh nor on site. They didn't look particularly good, and I figured they would be awful, but hey, it was free, and I'd try free dessert. I was shocked. They are good! I wouldn't go out of my way for them, nor would I tell you they are just like fresh, homemade cookies ... but really, they weren't bad at all. I can't believe I liked fast food cookies over many of the ones from local bakeries, but, I did. After my success with the first cookie, I returned to try out several other offerings from their dessert line, and they were all equally good. I was surprised every time! 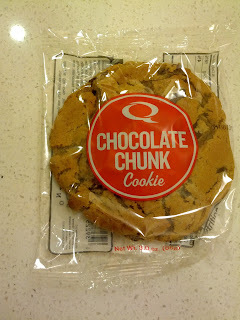 This was the first Quiznos cookie I tried, a classic chocolate chunk cookie. 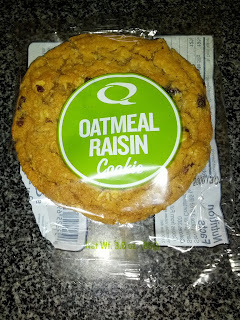 It was huge, easily the size of 3 standard cookies. It was soft, just like I like. I expected a not-fresh cookie to be much crisper. Sure, my personal preference is for it to be even softer than this, but really, a nice level of done-ness. The chocolate wasn't anything extraordinary, just standard milk chocolate, but the chunks were large and they were distributed nicely throughout the cookie. There were just the right amount, enough to get a chunk with most bites, but not dominating the flavor of the cookie. The dough was buttery and flavorful. I learned afterwards that you can get them heated up in the store, since duh, they specialize in toasting things. I think this could have been really good warm! 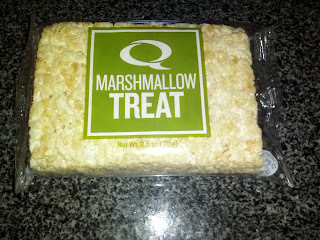 Thinking the cookie thing must have just been a fluke, I went for something completely different the next time: a marshmallow treat (aka, a Rice Krispie treat, made with generic crispies). It was another pre-packaged treat. I had seriously low expectations for this one. And ... again, it was pretty good! The rice cereal was crunchy, the entire thing was soft and not hard nor stale, and it was perfectly sweet. I haven't had one in ages, but I'm pretty sure this was much better than the real Rice Krispie brand treats you can buy in the stores. Probably even better than you'd make at home. 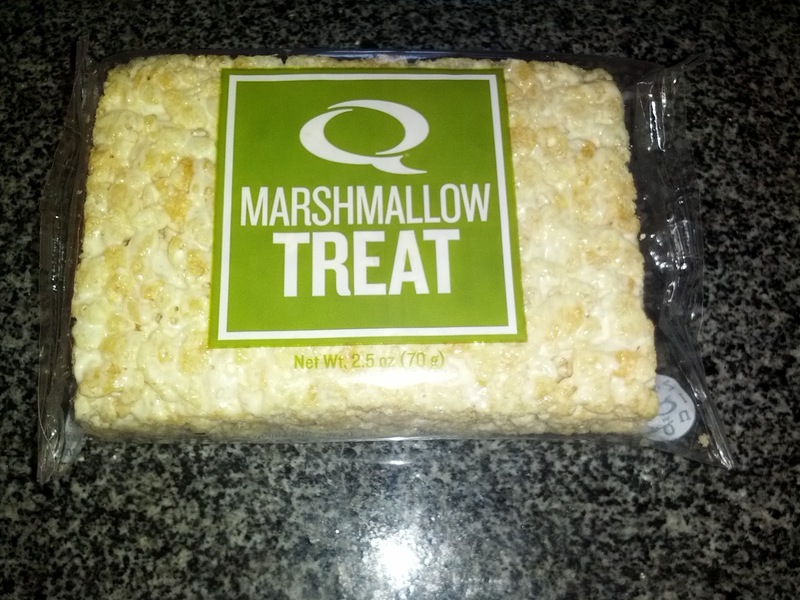 Obviously not much special about this, but if you ever want a rice crispie treat, this one really isn't bad! And like the cookie, it was huge, easily split into several portions. Texture-wise, it was perfect: super soft, almost breaking apart when you touched it. It was very sweet, with a delicious butteriness to it. Studded with plump plentiful raisins, but not too many, just enough to generally get one in every bite. 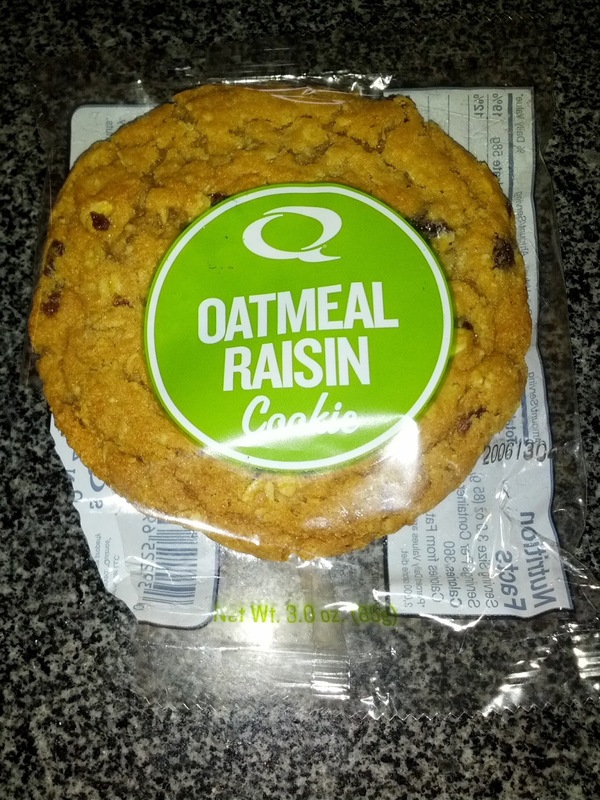 A slight heartiness from the oats, but this was certainly a sugary cookie, not a healthy one. 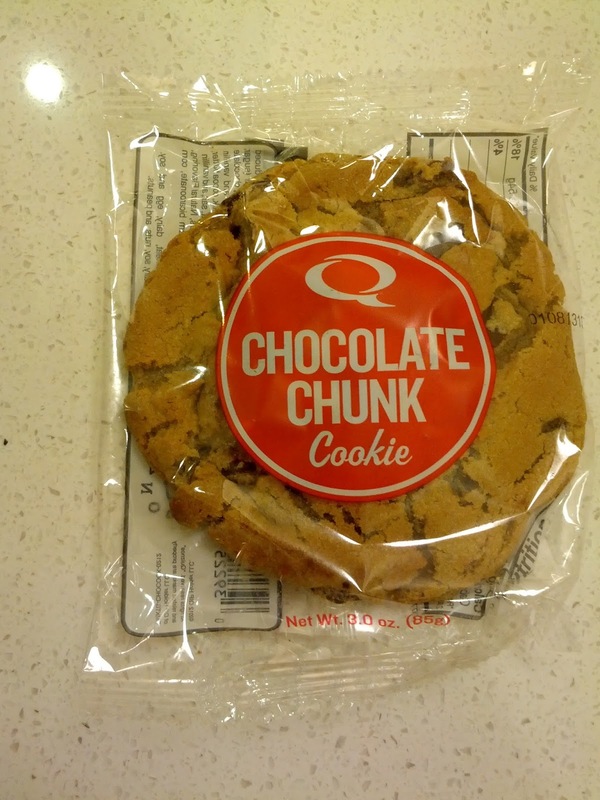 Everything I liked about the chocolate chunk cookie (soft, sugary, buttery flavor in the dough, proper amount of mix ins) was true for this cookie too. I'm not sure which was better. For the holidays, I visited my family in New Hampshire. Now, New Hampshire is a lovely place, and has many things to offer, but, a culinary destination it is not. I'm so thankful I grew up there, and although I never appreciated it as a child, as an adult, I realize how fortunate I was to be raised somewhere where I could play on the lake all summer, ski at a mountain in my hometown all winter, and drive by beautiful scenery every day of my life. But, particularly as my culinary world has expanded over the past few years, I've had a lot of disappointing dining adventures. I've had some pretty horrible meals, and have pretty much stopped trying to go out anywhere, choosing to just enjoy the nostalgia of my mom's cooking (and baking!) instead. On this recent visit however, I went out practically every single day, as the people I was visiting all wanted to go out. As expected, most of it was mediocre at best. I wasn't excited to do any more dining out, but I wanted to do something special with my parents one night, to give my mom a break before the holiday craze set in (she hosted a huge dinner on Christmas eve, and then a Christmas brunch, AND a Christmas day dinner), so I did a lot of research. Or, as much as I could do. New Hampshire is not the land of foodies and food bloggers, so there is scant information available. I read every Yelp review, TripDdvisor review, Chowhound post I could find. I read menus on restaurant websites, but I was lucky if places had websites to begin with, and even more lucky if the menus posted were even from 2012. One place that kept coming up was Home Hill Inn, located in Plainfield, the next town over. I had never been, nor had anyone I knew. But reviews seemed positive. They had a website AND even a Facebook page. And on that page, I discovered their upcoming New Year's Eve special menu - it featured foie gras! Now, you know I had a bit of a thing for foie gras back before it was banned in California, and have had very few opportunities to have it since. The rest of the menu also sounded absolutely amazing, including the foie, scallops, lobster, so many amazing ingredients. Of course, that was just on their special New Years menu, but their regular menu was also very appealing. The menu was surprisingly extensive for a small restaurant, featuring several seafood dishes and cuts of steak, but also lamb, veal, pork, duck, rabbit, and a vegetarian pasta dish. More impressive, each dish came with several sides, each unique, such as mascarpone polenta, grits, and celery root puree, rather than just a simple side of mashed potatoes. The starters were even more fascinating, including house made pâtés, terrines, cured meats and fish, smoked fish, etc. And, to satisfy the dessert lover in me, they are known for their pies. I was sold, and quickly made a reservation. You may have noticed at this point that I do not normally review restaurants not located in San Francisco. I had no intention of writing this review. I took a few photos while I was there, lazily, with my phone, just to include for reference to show my sister when I told her about the meal later, as she wasn't able to join. I did not take any notes as I dined. I did not copy down the menu descriptions. I was in no way prepared to write this review. But, I was so blown away by the experience that I had to write this up. I apologize for the lower quality review than normal, but I want you to know about Home Hill Inn, should you ever wind up in NH. Or even if you don't just wind up there, it really is a destination restaurant. To get to Home Hill Inn (which, by the way, is also an inn, if you are ever looking for a place to stay in New Hampshire), you drive down a dirt road for several miles. We drove past the farm where I used to go strawberry picking every summer in order for my mom to make her "famous" jam. The nearest neighbor is the local dairy farm, where of course Home Hill sources all of their dairy products. I am used to rural NH, but it felt like we were driving into the absolute middle of nowhere! I kept thinking we must have missed it. Protip: fear not, and drive on; I promise, it is worth it. We finally turned into the long drive, flanked by stone pillars, adorned with Christmas wreaths. White fenced horse paddocks were off in the distance. The main building was lit up with a warm glow. It was about as quaint and charming as it gets, and even though I grew up in the area, I was struck by just how adorable and inviting it was. Inside was just as nice, rustic yet elegant, and I was immediately at ease, and optimistic that this meal would be far better than the others I'd had on the trip. We passed by the lounge and pub area, where they serve a great sounding pub menu, complete with fish and chips, lobster rolls, meatloaf, and burgers. I really want to return some time to try out their casual offerings. We also passed by some private dining areas, where holiday parties were in full swing. The service was good, and matched the feel of the restaurant. It wasn't Michelin star service; no one came to fold my napkin when I left to use the bathroom, the crumbs on the table weren't scraped away between courses, and my mom's water glass did go empty a few times, as did my wine glass, but the waitress was knowledgeable about the dishes, friendly, and polite. I think a more formal service would have felt out of place in such a rustic setting. The pacing of the courses did feel a little slow to me, and was very slow to my parents, who are not accustomed to longer meals. I am not sure I would have noticed if I were with my usual dining companions, as we tend to enjoy some wine with our meal, and the slower pacing can be appreciated. I think some of the pace was simply due to the fact that they were really truly preparing all of our food to order. The restaurant was very small, and the menu so varied, that I don't think they could possibly have that much done in advance. I didn't mind the pace, but if you are accustomed to dinner never taking more than an hour, this could be a surprise. The only thing I was disappointed by was the wine list, particularly, the wines by the glass. There were only 5 reds, and a few whites. Partially, I know I am spoiled from being so close to wine country in SF, but also, with a place this size, it obviously isn't possible to have a large by the glass list, and my parents aren't drinkers, so a bottle was out of the question. They did have a bar program that surprised me, featuring weekly cocktail specials, all very creative sounding. To start our meal, we were brought a basket of housemade bread and a ramekin of whipped butter. My expectations for bread baskets are incredibly low, even at top restaurants. So many places bring cold, rather stale, uninspired bread and generic, hard, unspreadable butter. I was pleasantly surprised when the basket arrived with fresh, hot bread. Points for that. There were two varieties of bread, a sourdough, and a "bread ball". I started with the bread ball, as I'm not a fan of sourdough. 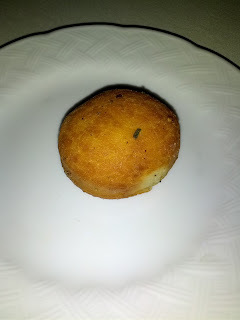 The bread ball was basically like a little donut hole, or fried dough, rolled in butter, parmesan and herbs. I didn't love it, but it was creative, quite different, and clearly freshly made. At this point, expectations were set. If they could get bread right, what else was in store for us? Seared Hudson Valley Foie Gras, Huckleberry Compote, Balsamic Gastrique, Mache, Duck Fat Toasted Brioche. $15. 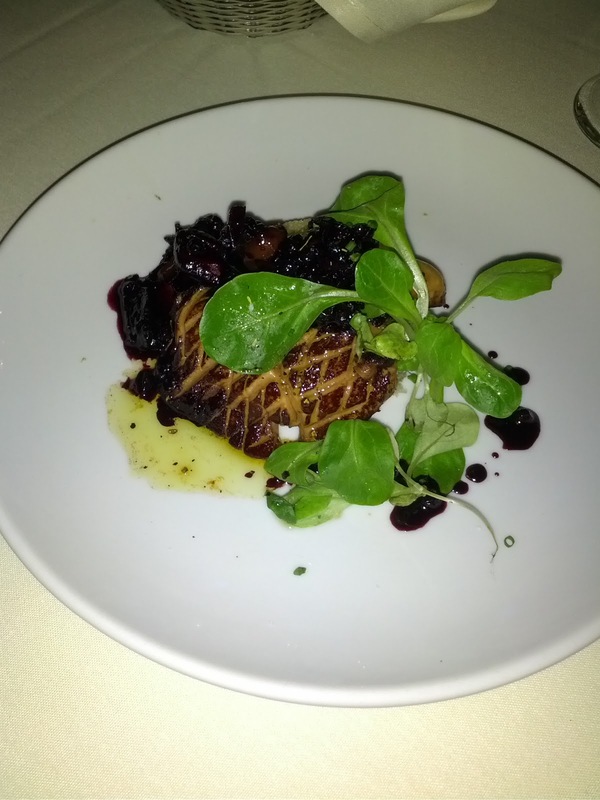 As I mentioned, they had foie gras on the upcoming New Year's Eve menu, but it was not on the regular menu. I asked the waitress if they had any additional specials that night, hoping that the foie would appear. She said no. I looked through the rest of the starters, and there were a slew that sounded fantastic, particularly the seafood ones. But … I can get seafood in San Francisco. I can't get foie. So, I asked the waitress specifically if they happened to have any foie in the kitchen. She seemed a little surprised, but obliged my request and went to check with the kitchen. I think my parents were a little horrified, as they are not the type to ever ask for anything to be modified. My dad asked me how I could do something like that, because what on earth would they charge me for it, if it wasn't on the menu? To my delight, our server returned saying that yes, they had foie, and the chef could whip something up for us. I eagerly said yes, even though I had no idea what I'd be getting. Would it be seared? A torchon? I had no idea. I was so excited. My mom participated in this adventure with me, although she's only had foie twice before, once at No. 9 Park in Boston (in several preparations, including their famous gnochhi) and once at another restaurant in my home town, but she didn't really enjoy it on the previous occasions, and I know she was just trying it again to humor me. My dad has never had foie, and refuses to try it, so he went for a endive and apple salad ($8), with bacon, candied nuts, and a buttermilk based dressing. I was way too distracted and happy with the foie that I didn't even ask for a bite. He seemed to enjoy it. Anyway, back to the foie. The chef himself came out and presented it to us, which was a extra bonus, as I enjoyed chatting with him for a few minutes. The foie was beautifully seared, as you can see from the visible crust in the photo. It had a slightly smoky flavor. The huckleberry gastrique was slightly sweet, slightly tart, nicely balanced on its own, and a perfect pairing with the foie. The mache added a little bitter component and welcome freshness against the fatty foie. The only part that wasn't successful for me was the brioche. I love brioche, particularly with my foie, and I like it buttered or oiled with my foie as well. But this was just too oily for me. My mom seemed to like it. My mom said over and over that this was the best foie she had ever had. I'm glad she finally got a chance to have a good preparation, so she can somewhat understand why I enjoy it. Like the courses that would follow, it was made with quality ingredients, paired well with the other components on the plate, and was well executed. My second favorite savory dish of the evening. 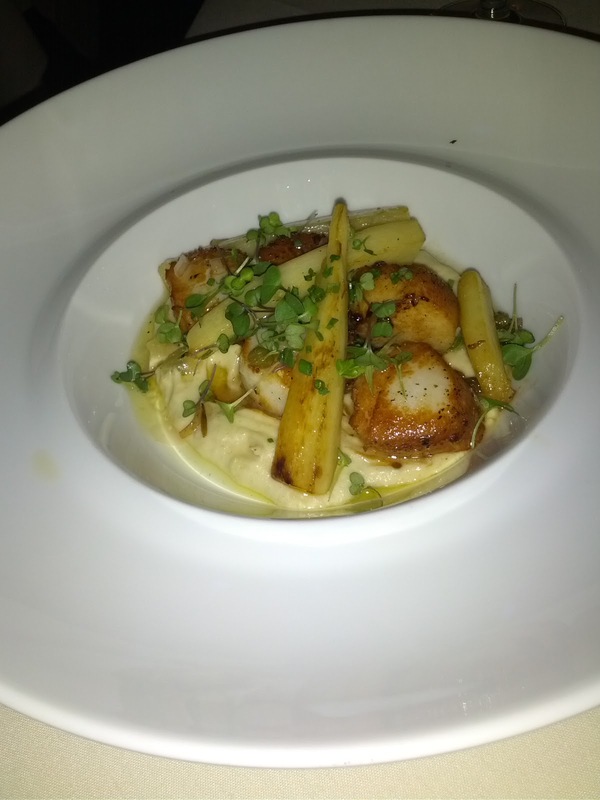 Scallops, celery root puree, root veggies. $26. My mom and I both wanted the scallops, but I let her order it, under the promise that she'd share. The scallops were well prepared, but slightly more done than I prefer, medium, rather than medium-rare. Had I ordered it myself, I probably would have asked for the scallops to be medium rare. The scallops themselves weren't particularly flavorful, but they weren't bad. The star of the dish was the celery root puree. It was delicious, creamy, and bursting with flavor. I loved they they elevating such a seemingly simple ingredient. Overall, this was a very good execution of a scallop dish, certainly better than most, but I wouldn't rave about it. My least favorite of the savory courses. It was a fair price for 5 large scallops. I wanted seafood, and since my mom picked the scallops, I needed to pick a different dish. I asked the server about the skate wing and she said it was a brand new menu item that night. 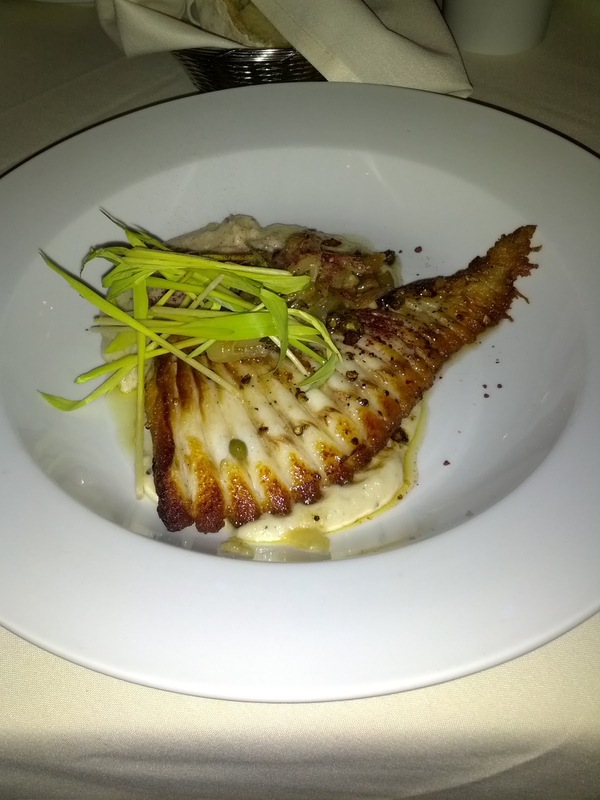 The skate was super fresh and local, coming from Glouscester, MA. Skate is not something that shows up on menus all that often (at least on the west coast), but the last time I had it was at Le Bernadin in New York, where it was phenomenal (as was everything there, which you might expect given that its a very well deserved 3 star Michelin restaurant). I decided to gamble and go for it, knowning I could fall back on a few bites of my mom's scallops if I didn't like it. I didn't need to worry. This was the best seafood dish I've had at any restaurant in the past year. If you follow my blog, you know I've had a lot of fantastic meals, dined at a lot of top restaurants in San Francisco. And this dish put them to shame. And it had a lot to live up to, given that my comparison point was Le Bernadin. The skate was perfectly cooked. I don't throw that word around lightly. It was beautifully crispy on the outside, yet moist and tender inside. One of the best cooked pieces of fish I've ever had. It was well seasoned. It made me wish I could find skate more often, as I love how it is firm and yet delicate at the same time. It was accompanyed by a marscapone polenta, which was just as delicious as you can imagine. Creamy, cheesy, quite good. I didn't think it worked that well with the fish however, it was too rich for the more delicate fish. It would have been phenomenal with a steak and some rich sauce. There was also some confit fennel, with some salty capers. They added a great balance of flavors, and went well with both the polenta and the skate, tying it all together. I also liked the very tender texture against the crispy fish. There was also something on top, that I couldn't identify. It was fresh and crispy, but I could have done without it. It didn't add anything to the dish, and didn't quite match the rest of the components. As you can guess, this was my favorite dish of the night. I'd order it again in a heartbeat. Kudos chef! My dad had a steak, with some beautiful looking ciopolini onions and fries. He isn't much of a steak eater, and my mom and I were both shocked at how he devoured the entire thing. I snuck a french fry. It was good, fresh, not oily, crispy, with some skin on. It definitely made me want to check out some of their lounge and bar food, particularly the fish and chips. Eggnog Crème Brûlée, Whipped Cream, Almond Cookies. $8. After such a stellar meal, I almost considered not getting dessert. That NEVER happens, as you know I'm a huge dessert girl. But I was so happy and satisfied at that point, I didn't want to risk ending on a less positive note. But then I saw the dessert menu. ZOMG. 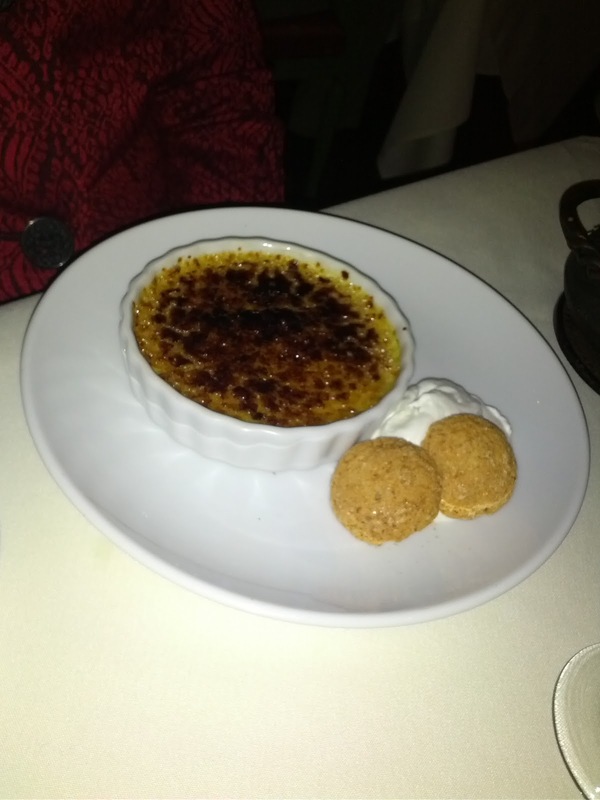 One thing immediately jumped out: Eggnog Crème Brûlée! You know me and crème brûlée. And I've been seriously craving and devouring every eggnog flavored item I've come across this season. And the eggnog was from the diary next door, how much more local does it get? Sold! The top passed the tap test, but tasting it quickly revealed that it was a little too torched. Rather than having a nice caramelized flavor, it tasted burnt. My mom wouldn't eat any of it and pushed it aside. It kinda grew on me when paired with my coffee, as the bitter flavor worked with it, but this was definitely a execution flaw, the only one we saw all evening. The custard was indeed eggnog flavored, but wasn't particularly creamy. It also did not have the temperature contrast that I like, with a warm top layer and cold body. It was not bad, but not particularly good. It came with some cookies on the side. They were crunchy almond flavored cookies, not remarkable. I'm not really sure why there was a pile of whipped cream also on the side. It got all over the side of the ramekin, and the cookies were awkwardly covered with it too. Overall, not bad, but not really good. Weakest dish of the night. Wouldn't order again. 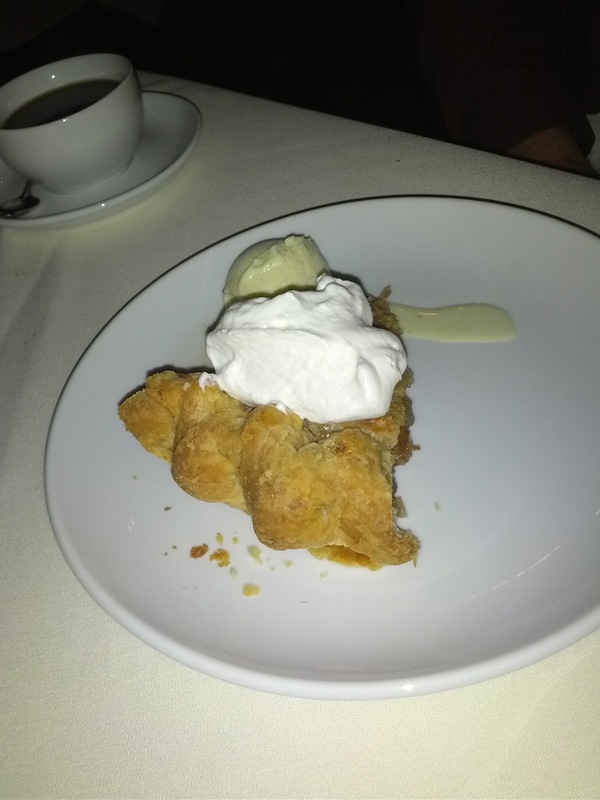 Double crust apple pie, whipped cream, vanilla ice cream. $8. Home Hill is known for their pies, which are also available full sized to take home. I encouraged my father to order one, and of course, to share with me. They had two selections available: apple or peach. Apple is one of my least favorite pies. Not that I don't like it, but I'd usually pick any other sort of pie over apple if given the choice. And I had apple pie a few days prior, and would be having my grandmother's apple pie for Christmas, so I really wasn't excited about this. But it was my dad's pick. The pie didn't win any plating awards. It was off center. The scoop of ice cream was a little melted and just off to the side. I was skeptical, but eagerly dug in. I'm glad we went for it, because it was a very good pie. You have to like crust to like this pie. Not only did it have a full top crust, the back crust was very thick. I love crust, and this was a very good one, flaky and buttery, so it didn't bother me at all, but the crust to filling ratio was certainly different from what I'm used to. It was loaded with large chunks of well spiced, perfectly cooked apples, not too mushy, not too firm. They get major bonus points for being served warm. Not lukewarm, but actually warm. I can't stand pie at restaurants being served cold, or even worse, halfheartedly reheated and lukewarm. And they get even more bonus points for coming with both whipped cream AND housemade vanilla ice cream. The ice cream was creamy and good, and being a contrast lover, I'm a total sucker for warm pie and cold ice cream. The whipped cream was clearly freshly made, fluffy, good. The best of the desserts, and I'd love to try some of their other pies, particularly varieties I'm more generally into. They also had a white chocolate and peppermint cheesecake with salted carmel sauce that sounded awesome, but we only had so much space left after such a delightful meal. Next time! We also enjoyed some coffee with our desserts, from a local roaster, served in individual french presses. I appreciated the waitress stating that mine was decaf as she set it down in front of me. It was a very strong coffee, had no "decaf funk" to it, and I really enjoyed it, even black. Black coffee, particularly paired with dessert, is my favorite, but there are few decafs that I can truly enjoy black! After a fairly disappointing Peruvian dinner at La Mar earlier in the week, we decided to check out the newly opened Limon Rotisserie in Bayview. The menu has many of the items from the original Limon and the Limon Rotisserie in the Mission, which I'd been to and enjoyed in the past. Ceviche Mixto: red snapper, calamari, tiger shrimp, peruvian corn, sweet potato, red onion in leche de tigre. $9.75. This was pretty good ceviche! The seafood was all clearly high quality. The calamari were tender and not rubbery, there was a generous amount of red snapper that was very fresh tasting, and the shrimp had a nice texture to them. The leche de tigre was really flavorful and made the dish really pop. This was a fresh, well balanced, tasty dish. In name and ingredients it was basically the exact same dish as we'd had at La Mar a few nights prior, but at La Mar the fish was grainy and oddly fishy, the shrimp chewy and flavorless, the calamari rubbery, and the marinade no where near as flavorful. And, it was almost twice as expensive. This ceviche was really a great deal. It was $9.75, contained 4 large shrimp, 8-10 calamari rings, and probably ~15 generous slices of snapper. While not sushi grade seafood, it seemed pretty high quality. I'm going to continue my Peruvian crawl as I have a few more places I want to check out, but so far, this is the one dish I'd go back for. Lomo Saltado: Traditional peruvian dish of stir-fried sirloin strips, onions, tomato and soy sauce, served with fries. $9.75. I didn't like this. The beef was really chewy and overcooked for my taste. I like the idea of having the fries in there, but the sauce was just so oily and salty that it ruined them for me. I love stir fried onions, but even they were ruined by the sauce. $9.75 was a good price for this much steak, but I would not get this again. Pollo a las Brasas: savory free-range chicken slowly roasted over open flame, sweet potato fries on side. Quarter size. $8.50. This is their signature dish, the rotisserie chicken. You can order a quarter, half, or full chicken, and each comes with your choice of two sides: rice, sweet potato fries, yuca fries, papas bravas, salad, etc and dipping sauces. The chicken was decent rotisserie chicken, as it is what they are known for. Juicy, crispy skin, etc but at the end of the day, it is just chicken. And I just don't love chicken. One side we picked was the sweet potato fries. They were better than average, with a pretty good sweet potato flavor and not overly oily. The best part of this dish however is not pictured - the dipping sauces! It came with three sauces, two cheesy spicy sauces and a chimichuri. I loved the cheesy sauces, and used everything in sight as a dipping device. Do we notice a theme here? Yes, Julie loves her sauces. The other side we picked were the yuca fries. They were nice and crispy on outside, warm and mushy on the inside. Not all that interesting on their own, but as another vessel for the dipping sauce ... super tasty! 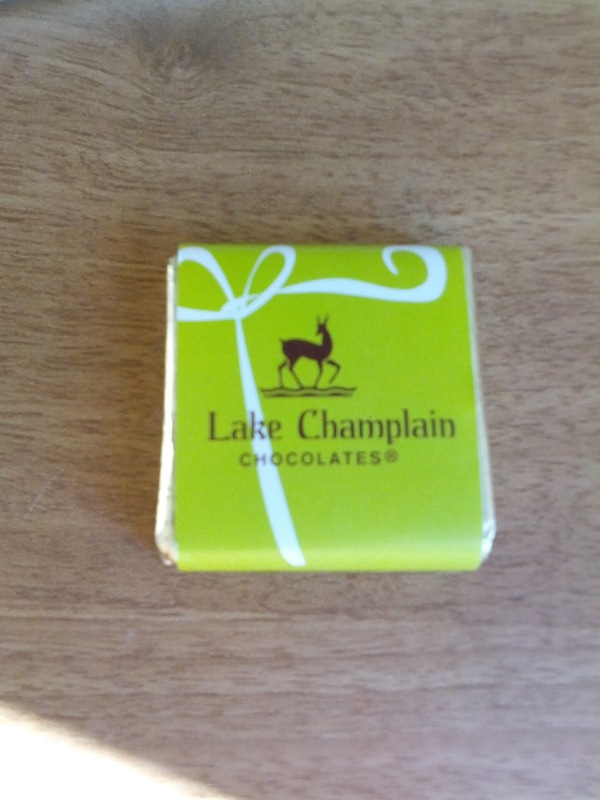 While visiting my family for the holidays, my mother received a gift from one of her patients: chocolates from Lake Champlain Chocolates. 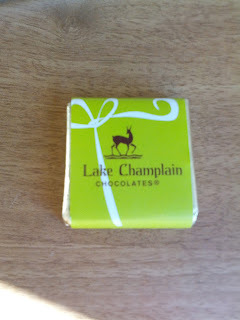 They are a local chocolate maker, from Vermont. And since my mom can't have chocolate, and I love trying out new chocolate, I gladly took them off her hands. They make a large assortment of bars (including single-origins), truffles, caramels, hot chocolates, etc, but I've only tried the basic milk and dark chocolate. When I went to write up this post, I discovered my notes from last year, and my opinions are fairly different. I wonder if they changed their recipes?